This page explains commonly used terms in chess in alphabetical order. Some of these have their own pages, like fork and pin. For a list of unorthodox chess pieces, see Fairy chess piece; for a list of terms specific to chess problems, see Glossary of chess problems; for a list of chess-related games, see List of chess variants. A pin against the king is called absolute since the pinned piece cannot legally move out of the line of attack (as moving it would expose the king to check). Cf. relative pin. Describes a piece that threatens a number of squares, or that has a number of squares available for its next move. It may also describe an aggressive style of play. Antonym: passive. Suspension of a chess game with the intention to finish it later. It was once very common in high-level competition, often occurring soon after the first time control, but the practice has been abandoned due to the advent of computer analysis. See also sealed move. A way to decide the result of an unfinished game. A tournament director, or an impartial and strong player, will evaluate the final position and assign a win, draw, or loss assuming best play by both players. See Touch-move rule. To adjust the position of a piece on its square without being required to move it. A player may only do this on their turn, and they must first say "I adjust", or the French equivalent J'adoube. A pawn that is on the opponent's side of the board (the fifth rank or higher). An advanced pawn may be weak if it is overextended, lacking support and difficult to defend, or strong if it cramps the enemy by limiting mobility. An advanced passed pawn that threatens to promote can be especially strong. A better position with the chance of winning the game. Evaluation factors can include space, time, material, and threats. A special form of battery in which a queen backs up two rooks on the same file. The standard way to record the moves of a chess game, using alphanumeric coordinates for the squares. Any player whose main occupation is not chess. The distinction between professional and amateur is not very important in chess as amateurs may win prizes, accept appearance fees, and earn any title, including World Champion. In the 19th century, "Amateur" was sometimes used in published game scores to conceal the name of the losing player in a Master vs. Amateur contest. It was thought to be impolite to use a player's name without permission, and the professional did not want to risk losing a customer. See also NN. The study of a game or a position, in order to evaluate the quality of the moves and various other aspects of the game or position. At the end of a game, the players will often do an analysis of the game. Cf. post-mortem. Written commentary on a game or a position using words, chess symbols or notation. A practice, common in the 19th century, whereby a player would announce a sequence of moves, believed by him to constitute best play by both sides, that led to a forced checkmate for the announcing player in a specified number of moves (for example, "mate in five"). A move or a plan that is not in accordance with the principles of positional play. Antipositional is used to describe moves that are part of an incorrect plan rather than a mistake made when trying to follow a correct plan. Antipositional moves are often pawn moves; since pawns cannot move backwards to return to squares they have left, their advance can create irreparable weaknesses. An opening variation that White uses against the Sicilian Defense (1.e4 c5) other than the most common plan of 2.Nf3 followed by 3.d4 cxd4 4.Nxd4 (the Open Sicilian). Some Anti-Sicilians include the Alapin Variation (2.c3), Moscow Variation (2.Nf3 d6 3.Bb5+), Rossolimo Variation (2.Nf3 Nc6 3.Bb5), Grand Prix Attack (2.Nc3 Nc6 3.f4 g6 4.Nf3 Bg7 and now 5.Bc4 or 5.Bb5), Closed Sicilian (2.Nc3 followed by g3 and Bg2), Smith–Morra Gambit (2.d4 cxd4 3.c3), and Wing Gambit (2.b4). A checkmate that occurs when the knight and rook trap the opposing king in a corner. A game that is guaranteed to produce a decisive result, because if there is a draw it is ruled a victory for Black. In compensation for this White is given more time on the clock. Often White is given six minutes, and Black five. This format is typically used in playoff tiebreakers when shorter blitz games have not resolved the tie. Refers to a maneuver of several separate moves by the king and by a rook where they end up as if they had castled. Also known as castling by hand. An aggressive action on a part of the chessboard, or to threaten the capture of a piece or pawn. See also counterattack, discovered attack, double attack, mating attack, and minority attack. Antonym: defense. White wins with 1.Rd7+! The black king is attracted away from the defense of the black queen with a skewer. A type of decoy involving a sacrifice of a minor or major piece on a square next to the enemy king, forcing the king to abandon the defense of another square. For example (see diagram), the black queen has interposed to block a check from the white queen, and White can check the king from the opposite direction to win the queen. An automaton is a self-operating machine. In chess, it refers to chess-playing machines that were in fact hoaxes and under the control of hidden human players. Automatons stirred up great interest in the 18th and 19th centuries and inspired early thoughts of the possibility artificial intelligence. By far, the most famous chess-playing "automaton" was The Turk, whose secret of human control was kept for a very long time. When the Turk was recreated in the 1980s, the addition of a chess-playing computer made it a true automaton. Symbol used for the bishop when recording chess moves in English. A player's first rank (the one on which the pieces stand in the starting position); White's back rank is Black's eighth rank, and vice versa. Also called first rank or home rank. A checkmate delivered by a rook or queen along a back rank from which the mated king is unable to move because it is blocked by friendly pieces (usually pawns) on the second rank. Also called a back-row mate. A situation in which a player is under threat of a back-rank mate and, having no time/option to create an escape for the king, must constantly watch and defend against that threat, for example by keeping a rook on the back rank. A pawn that is behind a pawn of the same color on an adjacent file and that cannot be advanced with the support of another pawn. White has a bad bishop, Black has a good bishop (Evans & 1967:66). A bishop that is hemmed in by the player's own pawns. See also good bishop. A position in which a king is the only man of its color on the board. A chess competition in which the players simultaneously play each other two games on two boards, each playing White on one and Black on the other. There is a clock at both boards. It removes the bonus in mini-matches of playing White first. Basque chess was first played in the 2012 Donostia Chess Festival in the Basque Country, Spain. Also called Basque system. A pair of white rooks are aligned along their battery, ready to do some action. To double rooks on a file, or to place a bishop and a queen on a diagonal. In chess problems, battery refers to an arrangement of two pieces in line with the enemy king on a rank, file, or diagonal so that if the middle piece moves a discovered check (or a threat other than a check) will be delivered. British Chess Federation, the former name of the English Chess Federation. See ECF. An abbreviation for the British Chess Magazine. An abbreviation for the 1982 openings reference book Batsford Chess Openings, by Raymond Keene and Garry Kasparov. The second edition (1989) is often called BCO-2. Cf. ECO and MCO. The theoretical absolute and ideal best moves from any given position. The white bishop is doing the work of a pawn and has no bigger prospects. A bad bishop stuck behind its own pawns and defending them—effectively doing the work of a pawn. A strong grip or stranglehold on a position that is difficult for the opponent to break. A bind is usually an advantage in space created by advanced pawns. The Maróczy Bind is a well-known example. See also squeeze. The player with two bishops is said to have the bishop pair. Two bishops are able to control the diagonals of both colors. In open positions, two bishops are considered to have an advantage over two knights, or a knight and a bishop. Also called the two bishops. Or bishop's pawn. A pawn on the bishop's file, i.e. the c-file or f-file. Sometimes abbreviated "BP". A situation in which one player has only a light-square bishop remaining while the other has only a dark-square bishop remaining. In endgames, this often results in a draw if there are no other pieces (only pawns), even if one side has a material advantage of one, two or even three pawns, since the bishops control different squares (see Opposite-colored bishops endgame). In the middlegame, however, the presence of opposite-colored bishops imbalances the game and can lead to mating attacks, since each bishop attacks squares that cannot be covered by the other. Also called bishops of opposite colors. The dark-colored squares on the chessboard are often referred to as "the black squares" even though they are often some other dark color. Similarly, "the black pieces" are sometimes actually some other (usually dark) color. See also white. The designation for the player who moves second, even though the pieces ("the black pieces") are sometimes actually some other (usually dark) color. See also White and first-move advantage. 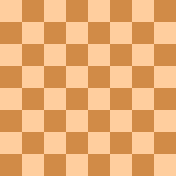 A form of chess in which one or both players are not allowed to see the board. A pair of rooks on the opponent's second rank are referred to as "pigs" as they tend to devour pawns and pieces, and "blind pigs" if they cannot find the mate. [from German: Blitz, "lightning"] A fast form of chess with a very short time limit, usually 3 or 5 minutes per player for the entire game. With the advent of electronic chess clocks, the time remaining is often incremented by 1 or 2 seconds per move. Black has a solid light-square blockade. White's bishop cannot challenge Black's minor pieces. The placement of a piece directly in front of an enemy pawn, where it obstructs the pawn's advance, and hinders the movements of the other enemy pieces. The enemy pawn provides some shelter to the piece that is blocking it, thereby protecting it from attacks by enemy pieces. A blockade is most effective against passed or isolated pawns. The ideal piece to use as a blockader is the knight. This strategy was famously formulated by Aron Nimzowitsch in 1924. A position where both sides are constrained from making progress, typically by interlocking pawn chain(s) dividing the available space into two camps. See also closed game. A very bad move, an oversight (indicated by "??" in notation). 2. An assignment in team chess, e.g. first board, second board, etc. Boden's Mate, named for Samuel Boden, is a checkmate pattern in which the king, usually having castled queenside, is checkmated by two crisscrossing bishops. Immediately prior to delivering the mate, the winning side typically plays a queen sacrifice on c3 or c6 to set up the mating position. An endgame position known to be a draw with perfect play. 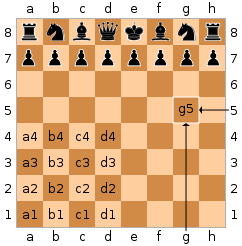 Historically this was established by reference to chess endgame literature, but in simplified positions computer analysis in an endgame tablebase can be used. An opening move found in standard reference books on opening theory. A game is said to be "in book" when both players are playing moves found in the opening references. A game is said to be "out of book" when the players have reached the end of the variations analyzed in the opening books, or if one of the players deviates with a novelty (or a blunder). An endgame position known to be a win with perfect play. Historically this was established by reference to chess endgame literature, but in simplified positions (currently seven pieces or fewer) computer analysis in an endgame tablebase can be used. A move that gains space and therefore freedom of movement, or the opening of a blocked position by the advance or capture of a pawn. Penetration of the opponent's position, or destruction of the defense, often by means of a sacrifice. A game that contains a spectacular, deep and beautiful strategic idea, combination, or original plan. A prize awarded at some tournaments for the best brilliancy played in the tournament. A time control method with time delay, invented by David Bronstein. When it becomes a player's turn to move, the clock waits for the delay period before starting to subtract from the player's remaining time. A popular chess variant played with teams of two or more. Making a path for a king in the endgame by providing protective cover against checks from line pieces. A well-known example is the Lucena position. Each side has 1 minute to make all their moves. A refutation of an opening, an opening line, a tactic, or a previously published analysis. A tournament round in which a player does not have a game, usually because there are an odd number of players. A bye is normally scored as a win (1 point), although in some tournaments a player is permitted to choose to take a bye (usually in the first or last round) and score it as a draw (½ point). Known as the goddess or muse of chess, whose name is taken from a nymph in a 1763 poem, Caïssa or The Game at Chess, by Sir William Jones. To plan a series of moves and considering possible responses, without actually moving the pieces. A move that seems good upon initial observation of the position, and that warrants further analysis. A knockout match in the Candidates Tournament. A tournament organised by the FIDE, the third and last qualifying cycle of the World Chess Championship. The participants are the top players of the Interzonal tournament plus possibly other players selected on the basis of rating or performance in the previous candidates tournament. The top ranking player(s) qualify(ies) for the world championship. The plan of attacking a kingside, sometimes a fianchetto position, by advancing the h-pawn with the intention of opening a file near the defender’s king. A particular piece with which one player attempts to deliver checkmate. Agreeing to play with a capped piece provides the stronger player an extra challenge, thereby conferring upon himself a handicap. When the capped piece is a pawn, it is called a pion coiffé [from French, "capped pawn"]. A move by a pawn or piece that removes from the board the opponent’s pawn or piece. The capturing piece then occupies the square of the captured piece (except in the case of a capture that is done en passant). A move in which the king and a rook are moved at the same time. It moves the king from the center to a flank where it usually is safer, and it develops the rook. It is the only time two pieces are moved in a turn. Castling can be done on either the kingside (notated 0-0) or the queenside (0-0-0). A situation where one side castles and a result is that the king is in more danger at the destination than on the initial square, either immediately or because lines and diagonals can be more readily opened against it. Castling queenside; in chess notation: 0-0-0. Castling kingside; in chess notation: 0-0. The category of a tournament is a measure of its strength based on the average FIDE rating of the participants. The category is calculated by rounding up the number: (average rating − 2250) ÷ 25. So each category covers a 25-point rating range, starting with Category 1 which spans ratings between 2251 and 2275. A Category 18 tournament has an average rating between 2676 and 2700. An abbreviation sometimes used for correspondence chess. The center squares are marked "×". Or centre. The four squares in the middle of the board. A king "in the center" can refer to an uncastled king on a center file. See also expanded center. Or centre file. The king's file (e-file) or queen's file (d-file). Or centre pawn. A pawn on the king's file (e-file) or queen's file (d-file). Moving a piece or pieces toward the center of the board, where they will not only control the center, but their influence will extend to other areas. Pieces are best placed near the center of the board, because they increase their power and maneuverability. Knights in particular benefit from being centralized. Slang for a primitive trap, often set in the hope of swindling a win or a draw from a lost position. Also called a cheap shot. A direct attack on the king by an enemy man. The attacked king is said to be in check. There are only three possible immediate responses to a check: capturing the attacking piece, moving the king to an unattacked square, or interposing a piece between the attacker and the king. In casual games a player usually announces "check", however this is not a requirement in tournament games. A position in which a player's king is in check and the player has no legal move (i.e. cannot move out of or escape the check). A player whose king is checkmated loses the game. Often shortened to mate. The failure of a player to see a good move or danger that should normally be considered obvious. The term was coined by Siegbert Tarrasch. Similar to Kotov syndrome. The chequered board used in chess, consisting of 64 squares (eight rows by eight columns) arranged in two alternating colors, light and dark. A device made up of two adjacent clocks and buttons, keeping track of the total time each player takes for their moves. Immediately after moving, the player hits their button, which simultaneously stops their clock and starts their opponent's. The picture shown displays an analogue clock where the term flag fall originates. Modern clocks are digital. The movable figures placed on the board in a game of chess. Includes both pieces and pawns. The thirty-two pieces required for a game, plus a chessboard. A chess-like game played using a different board, pieces, or rules than standard chess. Chess960, also known as Fischer Random Chess (originally Fischerandom), is a variation of the game invented and advocated by Bobby Fischer. The pieces and pawns all have their normal moves, but the setup of pieces on the first rank is random, except that a few rules must be followed: the king must be placed on a square between the rooks, the bishops are placed on squares of opposite color, and Black's pieces are placed opposite White's. The random setup can be established by dice toss, computer program, playing cards, or other methods. Castling may be done; the special Chess960 rules governing castling incorporate the normal castling in classic chess. Slang for capturing or exchanging pieces. See also wood. 1. An opening system geared towards forming a full pawn center. Classical ideas were challenged by hypermodern ideas. 2. A game using a longer time control such as 40/2; the opposite of fast chess categories such as rapid, blitz or bullet. Removal of piece from a square, rank, file or diagonal so that another piece may use it. It often involves sacrificing the piece that unblocked the position. In a game played clock move, a move is considered completed only after the clock is pressed. For example, one could touch a piece, then move a different piece—as long as the player has not pressed their clock button. This way of playing is uncommon but can be seen in casual games or blitz games. Time (consumed or remaining) on the chess clock, in a tournament game. A file on which White and Black each have a pawn. A closed game has few open lines (files or diagonals). It is generally characterized by interlocking pawn chains, cramped positions with few opportunities to exchange, and extensive maneuvering behind lines. Such a game may evolve and later become an open game. See also positional play. A Closed Game is a particular opening that begins with the moves 1.d4 d5. It is also known as a Double Queen's Pawn Opening or Double Queen's Pawn Game. See also Open Game and Semi-Open Game. A tournament in which only invited or qualifying players may participate, as opposed to an open tournament. Also called an invitational tournament. Adjective used to describe a move, player, or style of play characterized by risky, positionally dubious play that sets traps for the opponent. The name comes from the notion that one would expect to see such play in skittles games played in a coffeehouse or similar setting, particularly in games played for stakes or blitz chess. The Blackburne Shilling Gambit is a typical example of coffeehouse play. Or colour. The white or black pieces, and the white or black squares. The actual pieces and squares may be other colors, usually light and dark, but they are referred to as white and black. See White and Black in chess. A sequence of moves, including forced moves, and often involving a sacrifice, to gain an advantage. That which is gained in return for a sacrifice or some other action. If material is sacrificed there may be a gain in development, or if a minor piece is exchanged for two or three pawns, the pawns would be the compensation. A term for a move that seems likely to have been played by a computer rather than a human, because the move seems counterintuitive, or seems not to make immediate sense, or seems to eventually make sense, but not until far into the future of the game. Computer moves seem to be what they are: moves based on the brute force of millions of calculations, and not based on intuition, aesthetics, or emotion. A computer move would overlook a dramatic capture that might cause an opponent to resign on the spot in favor of an obscure move that may eventually turn out to be only slightly better. At one time the term was used disparagingly, but the definition has evolved as computers have improved. It is a term that is occasionally used to suggest that a player has been assisted by a computer. Passed pawns on adjacent files. These are considered to be unusually powerful (often worth a minor piece or rook if on the sixth rank or above and not properly blockaded) because they can advance together. See also connected pawns. Refers to two or more pawns of the same color on adjacent files. Cf. isolated pawns. Two rooks of the same color on the same rank or file with no pawns or pieces between them. Connected rooks are usually desirable. Players often connect rooks on their own first rank or along an open file. See also doubled rooks. The improvement of a player's position by the reposition of one or more pieces to better square(s), typically after a player's attack or combination has left their pieces in poor positions or uncoordinated. When a player’s pawn, piece or pieces guard a square, or squares, or a file, or a rank in such a way that the territory can be advantageously used; and the opponent is prevented from using the territory. Having one or more pieces that attack any of the four center squares; an important strategy, and one of the main aims of openings. In chess problems, an unintended duplicate solution, or a refutation. See also Glossary of chess problems#cook. An abbreviation for correspondence game. Chess played at a long time control by long-distance correspondence. Traditionally correspondence chess was played though the post; today it is usually played over a correspondence chess server or by email. Typically, one move is transmitted in every correspondence. Corresponding squares are pairs of squares such that when a king moves to one square, it forces the opponent's king to occupy the other square in order to hold the position. If the opponent's king cannot move to the required square it is zugzwang and a disadvantage. Corresponding squares usually occur in pawn endgames. The theory of corresponding squares has developed to include complex calculations based on math-like formulas. Also called related squares. Cf. opposition. An attack that responds to an attack by the opponent. A gambit offered by Black, for example the Greco Counter Gambit, usually called the Latvian Gambit today (1.e4 e5 2.Nf3 f5?! ); the Albin Countergambit (1.d4 d5 2.c4 e5); and the Falkbeer Countergambit (1.e4 e5 2.f4 d5). An opening need not have "countergambit" in its name to be one, for instance the Benko Gambit (1.d4 Nf6 2.c4 c5 3.d5 b5); the Englund Gambit (1.d4 e5?! ); the Budapest Gambit (1.d4 Nf6 2.c4 e5); the Blackburne Shilling Gambit (1.e4 e5 2.Nf3 Nc6 3.Bc4 Nd4?! ); and many lines of the Two Knights Defense (e.g. 1.e4 e5 2.Nf3 Nc6 3.Bc4 Nf6 4.Ng5 and now 4...Bc5!? [the Wilkes–Barre Variation or Traxler Counterattack]; 4...Nxe4?! ; 4...d5 5.exd5 Na5 6.Bb5+ c6 [the main line]; 4...d5 5.exd5 Nd4 [the Fritz Variation]; and 4...d5 5.exd5 b5 [the Ulvestad Variation]) are all examples of countergambits. The defending side's own aggressive action. A disparaging term for a move considered unsophisticated, especially an unnecessary single-step advance of the rook's pawn in the opening. The term was popular in London in the late 19th century. To protect a piece or control a square. Having limited mobility in a position. The moment in a game or opening when the evaluation shows that things are about to change, either towards an advantage for one player, or towards equality; a wrong move can be disastrous. A cross-check is a check played in reply to a check, especially when the original check is blocked by a piece that itself either delivers check or reveals a discovered check from another piece. An arrangement of the results of every game in a tournament in tabular form. The names of the players run down the left side of the table in numbered rows. The names may be listed in order of results, alphabetically, or in pairing order, but results order is most common. The columns are also numbered, each one corresponding to the player in the same numbered row. Each table cell records the outcome of the game between the players on the intersecting row and column, using 1 for a win, 0 for a loss, and ½ for a draw. (In a double round-robin tournament each cell contains two entries, as each pair of players plays two games alternating White and Black.) Every game is recorded twice, once from the perspective of each player. The diagonal cells that correspond to the player playing himself are marked with a * or × or other symbol since they are not used. For examples see Hastings 1895 chess tournament, Nottingham 1936 chess tournament, and AVRO tournament. Slang for a quick win, especially an overwhelming attack versus poor defensive play. A crushing move is a decisive one. One of the two bishops that moves only on the dark squares. In the initial position, White's dark-square bishop is on c1; Black's is on f8. Cf. light-square bishop. The 32 dark-colored squares on the chessboard, such as a1 and h8. A dark square is always located at a player's left hand corner. Cf. light squares. A dead draw by means of insufficient material. King versus king and bishop will not ever lead to checkmate. A drawn position in which neither player has any realistic chance to win. A dead draw may refer to a position in which it is impossible for either player to win (such as insufficient material), or it may refer to a simple, lifeless position that would require a major blunder before either side would have a chance to win. This is a tactic used to lure a piece to a particular square. 1. A move or plan to meet the opponent's attack. 2. Part of the name of openings played by Black; e.g. the Scandinavian Defense, King's Indian Defence, English Defence, etc. The inverse of a decoy. Whereas a decoy involves luring an enemy piece to a bad square, a deflection involves luring an enemy piece away from a good square; typically, away from a square on which it defends another piece or threat. Deflection is thus closely related to overloading. A large standing chess board used to analyze a game or show a game in progress. Johann Löwenthal invented the demonstration board in 1857. A system of recording chess moves, used primarily in the English and Spanish speaking countries until the 1980s. Descriptive notation is based on natural language descriptions of chess moves rendered in abbreviated form, for example "pawn to queen's bishop's fourth" is rendered as "P-QB4". Now replaced by the standard algebraic notation. A piece that seems determined to give itself up, typically to bring about stalemate or perpetual check. Also a threatened piece that sacrifices itself for the maximum compensation possible. The movement of non-pawn pieces in the opening from their original squares to squares where they can be more active. Development of one's pieces is one of the objectives of the opening phase of the game. A line of squares of the same color touching corner to corner, along which a queen or bishop can move. An attack made by a queen, rook or bishop when another piece or pawn moves out of its way. Once the e4-bishop moves, it is discovered check by the rook. A discovered attack to the king. This occurs when a player moves a piece, resulting in another piece putting their opponent's king in check. A situation that occurs in games and in endgame studies when a piece is attacked and appears to have a number of destination squares, but the squares are guarded and the piece cannot avoid being captured. Two attacks made with one move: these attacks may be made by the same piece (in which case it is a fork); or by different pieces, for example in a discovered attack when the moved piece also makes a threat. A check delivered by two pieces at the same time. A double check necessarily involves a discovered check. By its nature a double check cannot be met by interposing a defending piece in the line of attack, or by capturing an attacker; when subjected to a double check, the attacked king must move, which makes the double check especially powerful as an attacking tactic. Two pawns of the same color on the same file; generally considered a weakness due to their inability to defend each other. A powerful configuration in which a player's two rooks are placed on the same file or rank with no other men between them. They defend each other and attack along the shared file or rank, as well as two additional ranks or files. The configuration can be especially decisive in the endgame. A game that ends without victory for either player. Most drawn games are draws by agreement. The other ways that a game can end in a draw are stalemate, threefold repetition, the fifty-move rule, and insufficient material. A position is said to be a draw (or a "drawn position" or "theoretical draw") if either player can, through correct play, eventually force the game into a position where the game must end in a draw, regardless of the moves made by the other player. A draw is usually scored as ½ point, although in some matches only wins are counted and draws are ignored. A game that is ended by both players accepting a draw. See also resign. Hypothetical scenario whereby elite-level chess players, aided by modern computer analysis, become so good that they never make mistakes, leading to endless drawn games (since chess is widely believed to be drawn with best play from both sides). An opening variation that commonly ends in a draw. See also Collection of drawing lines Chessgames.com. An opening line played with the intent of drawing the game. An adjective describing a position or game that is likely to end in a draw. A type of chess handicap where one player (Black in an Armageddon game) only has to draw in order to win the match. A proposal by a player to the opponent that the game be drawn by agreement. A style of play in which the activity of the pieces is favored over more positional considerations, even to the point of accepting permanent structural or spatial weaknesses. Dynamism stemmed from the teachings of the Hypermodern school and challenged the dogma found in more classical teachings, such as those put forward by Wilhelm Steinitz and Siegbert Tarrasch. To remove the opponent's piece or pawn from the board by taking it with one's own piece or pawn. See also capture. The English Chess Federation (ECF) is the governing chess organisation in England and is one of the federations of the FIDE. It was known as the British Chess Federation (BCF) until 2005 when it was renamed. The Encyclopaedia of Chess Openings (ECO), a standard and comprehensive chess opening reference. Also a classification system (ECO code) for openings that assigns an alphanumeric code from A00 to E99 to each opening. An edge is a small but meaningful advantage in the position against one's opponent. It is often said White has an edge in the starting position, since White moves first (see First-move advantage in chess). The Elo rating system is a method for calculating the relative skill levels of chess players, named after Arpad Elo. Since 2012, FIDE publishes a monthly international chess rating list using the Elo system. The third and last phase of the game, when there are few pieces left on the board. The endgame follows the middlegame. A computerized database of endgames with a small number of pieces, providing perfect play for both players, and thus completely solving those endgames. By 2012, tablebases have been calculated for all positions with up to seven pieces. After 1.d4 c5 2.d5 e5, White can play 3.dxe6, capturing the e-pawn en passant on the next move only. The white pawn is placed on e6, and the black pawn on e5 is removed from the board. [from French, "in the act of passing"] The rule that allows a pawn that has just advanced two squares to be captured by an enemy pawn that is on the same rank and adjacent file. The pawn can be taken as if it had advanced only one square. Capturing en passant is possible only on the next move. The pawn on e4 is en prise. [from French, "in a position to be taken", often italicized] En prise describes a piece or pawn exposed to a material-winning capture by the opponent. This is either a hanging piece, an undefended pawn, a piece attacked by a less valuable attacker, or a piece or pawn defended insufficiently. For instance, 1.e4 Nf6 2.Nf3? leaves White's e-pawn en prise. A checkmate position where the king is blocked on both sides by its own rooks. An abbreviation for Extended Position Description. Or equalise. To reach a position where the players have equal chances of winning, referred to as equality. In the opening, because White has the advantage of the first move, the immediate goal for Black is to achieve equality. Or simply eval. The analysis of a position. A computer or engine evaluation is a means of assigning a number value to a position, based not on intelligence, but on algorithms, which vary from engine to engine and depend on engine strength. Engine evaluations have foibles and imperfections even when functioning as designed. If an engine describes a position as +2.50, the plus sign (+) indicates the position is favorable to White; a minus sign (−) indicates the position is favorable to Black. The number can correspond to the approximate value of pieces, although engines use other factors besides material. The notation +2.50 indicates that White is ahead by two and one-half pawns. The notation +M4 indicates that White can force checkmate in four moves. Cf. analysis. To swap or trade pieces by capture. Usually the pieces are of equal value (i.e., rook for rook, knight for knight, etc. ), or of bishop for knight (two pieces that are considered approximately equal in value). Also called an even exchange. The advantage of a rook over a minor piece (knight or bishop). The player who captures a rook for a minor piece is said to have "won the exchange", the player who has lost the rook has "lost the exchange". An exchange sacrifice is giving up a rook for a minor piece. This is a type of opening in which there is an early, voluntary exchange of pawns or pieces. Chess games played for the public in various formats and for various purposes, often to promote the game, or a particular match or player, or as a fundraiser. An exhibition may pit two masters against each other, and normally use chess clocks. In a simultaneous exhibition, one player takes on a number opponents at once, and it is often not timed. A blindfold exhibition is the same but more challenging, since the exhibitor plays without seeing the boards. The central sixteen squares of the chessboard. A king lacking pawns to shield it from enemy attack. A Forsyth–Edwards Notation derivative format that contains the position on the chessboard, but not the game. It is primarily used to test chess engines. Abbr. EPD. A knight fork that simultaneously attacks the enemy king (giving check), queen, and possibly other pieces. Also known as a "family check". An abbreviation for figurine algebraic notation, which substitutes symbols for letters to represent piece names (e.g. ♘f3 instead of Nf3). A form of chess in which both sides are given less time to make their moves than under the normal tournament time controls. See also: rapid chess, blitz chess, bullet chess. An abbreviation for Forsyth–Edwards Notation. An abbreviation for the FICGS Grandmaster title. To develop a bishop to the board's longest diagonal on the file of the adjacent knight (b2 or g2 for White; b7 or g7 for Black). The Italian word ("little flank") is pronounced "fyan-ketto". A correspondence chess title calculated by the FICGS (Free Internet Correspondence Games Server) organization. The World Chess Federation (Fédération Internationale des Échecs), the primary international chess organizing and governing body. The abbreviated name FIDE is nearly always used in place of the full name in French. A chess title ranking below International Master. Abbr. FM. A draw may be claimed if no capture or pawn move has occurred in the last fifty moves by either side. A column of the chessboard. A specific file can be named either using its position in algebraic notation, a–h, or by using its position in descriptive notation. For example, "f-file" and "king bishop file" both denote the squares f1–f8 (or KB1–KB8 in descriptive notation). [from German, "finger mistake"] An error caused by unthinkingly touching the wrong piece or releasing a piece on the wrong square, forcing the player to move that piece in accordance with the touch-move rule. In team chess, the player who is assigned to face the strongest opponents. Also called top board. Second board faces the next strongest players, followed by third board, and so on. Generally board assignments must be made before the competition begins and players may not switch boards, although reserve players are often allowed as substitutes. The slight (by most accounts) advantage that White has by virtue of moving first. The expression "the first player" is sometimes used to refer to White. A time control method with time delay, invented by Bobby Fischer. When it becomes a player's turn to move, the delay is added to the player's remaining time. Part of an analogue chess clock, usually red, that indicates when the minute hand passes the hour. To "flag" someone means winning the game on the basis of the opponent exceeding the time control. The queenside a-, b-, and c-files; or the kingside f-, g-, and h-files. Distinguished from the center d-file and e-file. Also called wing. An opening played by White and typified by play on one or both flanks. A square to which a piece can move, that allows it to escape attack. Also called escape square. See also luft. An abbreviation for the FIDE Master title. The shortest possible chess game ending in mate: 1.f3 e5 2.g4 Qh4# (or minor variations on this). A sequence of two or more moves culminating in checkmate that the opponent cannot prevent. A move that is the only one that does not result in a serious disadvantage for the moving player. Forced can also be used to describe a sequence of moves for which the player has no viable alternative, for example "the forced win of a piece" or "a forced checkmate". In these cases the player cannot avoid the loss of a piece or checkmate, respectively. A move that presents a threat and limits the opponent's responses. Refers to losing the game by breaking rules, by absence or by exceeding the time control (forfeit on time). A simultaneous attack by a single piece on two (or more) of the opponent's pieces (or other direct target, such as a mate threat). When the attacker is a knight the tactic is often specifically called a knight fork. Some sources state that only a knight can give a fork and that the term double attack is correct when another piece is involved, but this is by no means universal usage. A standard notation for describing a particular board position of a chess game. The purpose of FEN notation is to provide all the necessary information to restart a game from a particular position. Abbr. FEN. In endgame theory, a fortress is an impenetrable position which, if obtained by the side with a material disadvantage, may result in a draw due to the stronger side's inability to make progress. A game that is not played as part of a match, tournament, or exhibition. Often the game is not timed, but if a chess clock is used rapid time controls are common. The term refers only to the circumstances in which the game is played, not the relationship between the players or the intensity of the competition. Also called casual game. A sacrifice (usually of a pawn) used to gain an early advantage in space or time in the opening. A synonym for chess clock. The record of a game in some form of notation, usually algebraic notation. Also called simply score. In over-the-board tournaments, the game score is recorded on a score sheet. [from French: gardez la reine!, "Protect the Queen!"] An announcement to the opponent that their queen is under direct attack, similar to the announcement of "check". This warning was customary until the early 20th century. Metaphorically, a hypothetical player who always plays perfectly. A bishop that has greater mobility, because the player's own pawns are on squares of color opposite to that of the bishop. See also bad bishop. The highest title a chess player can attain (besides World Champion). Awarded by FIDE, it cannot be taken away. Abbr. GM. A game in which the players agree to a quick draw. Originally it referred to such games between grandmasters, but the term can now refer to any such game. A typical sacrifice of a bishop by White playing Bxh7+ or by Black playing ...Bxh2+ against a castled king to initiate a mating attack. Also known as the classical bishop sacrifice. A file on which only one player has no pawns. Unprotected and exposed to capture. A hanging piece may also be said to be en prise. Two pawns of the same color on adjacent files, with no pawns of the same color on the files either side of them. The term is used almost exclusively for pawns on the c- and d-files, and usually for two pawns on the same rank (side by side). They can be a strength, a weakness or neutral depending on the position. They are typically an attacking rather than a defensive asset. A nickname for the h-pawn, sometimes occurring in the expression, "Harry the h-pawn". German word that is freely translated as "candidates tournament". In the early part of the 20th century, it was necessary for the ambitious European amateur to win a succession of prizes in small tournaments, before they could progress to a higher level of competition. The creation of the hauptturnier enabled the process to become more formalized, and they became a regular feature of the major German chess congresses. Winning such an event conferred the title of 'Master of the German Chess Federation', and this, in turn, could be used to gain admittance to prestigious international tournaments. Some of the best players in chess history, such as Emanuel Lasker and Siegbert Tarrasch, secured their Master titles and advanced their chess careers in this way. A square that is inside or near a player’s territory that cannot be controlled by a pawn. It is a gap in a player’s pawn configuration, and especially dangerous when the hole is close to the center or near the king. A knight landing on a hole may be part of an attack. An example of a hole is e4 in the Stonewall Attack. Rank one for White; rank eight for Black. See back rank. After 30.Qe2. Black's Horwitz bishops are aimed at White's kingside. A player's light-square and dark-square bishops placed so that they occupy adjacent diagonals, creating a potent attack. Also called raking bishops, and sometimes Harrwitz bishops. a move a human would make, as opposed to the kind of move that only a computer would make. A pairing technique invented in 1921 by George Dickson Hutton for matching teams of players in which only one game is required per player. Has been used regularly for correspondence team events and for matches between many teams conducted on one day. Also called jamboree pairing. A school of thought that prefers controlling the center with pieces from the flanks as opposed to occupying it directly with pawns. Two major proponents of hypermodernism were Réti and Nimzowitsch. See also classical. See International Correspondence Chess Federation. An abbreviation for the International Correspondence Chess Federation. An abbreviation for Internet chess server. An abbreviation for the older term International Grandmaster. The modern usage is Grandmaster (GM). A move that is not permitted by the rules of chess. An illegal move discovered during the course of a game must be corrected. A position in a game that is a consequence of an illegal move or an incorrect starting position; a position that is impossible to reach by any sequence of legal moves. An abbreviation for the International Master title. Any difference between the positions of White and Black. An imbalanced position is one where White and Black both have unique advantages. Conversely, a balanced position may be drawish. A move that is not the best, but not as bad as a blunder. Refers to the amount of time added to each player's time before each move. For instance, rapid chess might be played with "25 minutes plus 10 second per move increment", meaning that each player starts with 25 minutes on their clock, and this increments by 10 seconds after (or before) each move, usually using the Fischer Delay method. See Time control#Compensation (delay methods). In the KID Fianchetto Variation (1.d4 Nf6 2.c4 g6 3.Nf3 Bg7 4.g3 0-0 5.Bg2 d6 6.0-0), both sides have Indian bishops. A fianchettoed bishop, characteristic of the Indian defenses, the King's Indian and the Queen's Indian. An opening that begins 1.d4 Nf6. Originally used to describe queen's pawn defenses involving the fianchetto of one or both black bishops, it is now used to describe all Black defenses after 1.d4 Nf6 that do not transpose into the Queen's Gambit. The ability to make attacking moves, and force the course of play. It is an aspect of time. The attacking player has the initiative, and the defending player attempts to seize it. A synonym for theoretical novelty. An endgame scenario in which all pawns have been captured, and one side has only its king remaining while the other has only its king, a king plus a knight, or a king plus a bishop. A king plus bishop versus a king plus bishop with the bishops on the same color is also a draw, since neither side can checkmate, regardless of play. Situations where checkmate is possible only if the inferior side blunders are covered by the fifty-move rule. See Draw (chess)#Draws in all games. The interruption of the line or diagonal between an attacked piece and its defender by interposing a piece. A tournament official who arbitrates disputes and performs other duties such as keeping the score when players are under time pressure. The International Correspondence Chess Federation (abbr. ICCF) was founded in 1951 to replace the International Correspondence Chess Association (ICCA). Abbr. IGM. The original name of the FIDE title now simply called Grandmaster (GM). A chess title that ranks below Grandmaster but above FIDE Master. Abbr. IM. An external server that provides the facility to play, discuss, and view chess over the Internet. Abbr. ICS. To move a piece between an attacking piece and its target, blocking the line or diagonal of attack. Interposing is not possible if the attacker is a knight, king, or pawn, thus only possible in case of attacking rooks, bishops, or queens. Interposing a piece is one of the three possible responses to a check. A tournament organised by the FIDE starting from the 1950s to 1993. It was the second qualifying cycle of the World Chess Championship. The participants were selected from the top players of the Zonal tournaments. The top ranking players qualified for the Candidates Tournament. Since 1998 the winners of the zonal tournaments have played short matches against each other over a few weeks in a knockout-style competition to determine who is eligible for the Candidates Tournament. A way of thinking that looks for the winning strategy not by calculating, but by a feeling or a hunch, that may be prompted subconsciously while studying the position, its visual patterns and dynamics, or by one’s memory of previous experience. An abbreviation for isolated queen pawn. See also isolani. In early 19th-century chess literature, all openings that did not begin with either 1.e4 e5 or 1.d4 d5 were classified as "irregular". As opening theory developed and many openings previously considered "irregular" became standard (e.g. the Sicilian Defence), the term gradually became less common. Opening books today are more likely to describe debuts such as 1.b4 (the Sokolsky Opening) as "uncommon" or "unorthodox". Refers to a d-pawn with no pawns of the same color on the adjacent c-file and e-file, and is a synonym for isolated queen pawn (abbr. IQP). The term was coined by Nimzowitsch, who considered the isolani as a weapon of attack in the middlegame but an endgame weakness; he considered the problem of hanging pawns to be related. See also Pawn structure#Queen's Gambit – Isolani. A pawn with no pawn of the same color on an adjacent file. A white bishop developed to c4 or a black bishop developed to c5. A bishop so developed is characteristic of the Italian Game. In the Giuoco Piano both players have Italian bishops. The Italian bishop stands in contrast to the "Spanish" bishop on b5 characteristic of the Ruy Lopez. "Italian" may be used as an adjective for an opening where one or both players have Italian bishops. (from French, "I adjust", pronounced [ʒa.dub]) See Touch-move rule. A player says "j'adoube" as the international signal that he or she intends to adjust the position of a piece on the board without being subject to the touched piece rule. The verb adouber, literally "to dub" (raise to the knighthood) is rarely used in contemporary French outside of this context. A local language equivalent, e.g. "I am adjusting" is generally acceptable. Symbol used for the king when recording chess moves in English. 2. In pawn endings, a square whose occupation by one side's king guarantees the achievement of a certain goal, such as the promotion of a pawn or the win of a pawn. The King's Gambit Accepted opening. The King's Gambit Declined opening. The King's Indian Attack opening. As a spectator, making comments on a chess game that can be heard by the players. Kibitzing on a serious game while it is in progress (rather than during a post-mortem) is a serious breach of chess etiquette. Attacking a piece, often a knight, with a pawn, so that it will move. Kicking a piece may lead to gaining a tempo, or may force the opponent to concede control of key squares. The King's Indian Defence opening. Or king's bishop. The bishop that is on the kingside at the start of the game. The terms king knight and king rook are also used. Sometimes abbreviated "KB", "KN", and "KR", respectively. A sustained attack on the enemy king that results in the king being driven a far distance from its initial position, typically resulting in its checkmate. Some of the most famous games featuring king hunts are Edward Lasker–Thomas, Polugaevsky–Nezhmetdinov, and Kasparov–Topalov. Or king's knight. The knight that is on the kingside at the start of the game. The terms king bishop and king rook are also used. Sometimes abbreviated "KN", "KB", and "KR", respectively. Or king's pawn. A pawn on the king's file, i.e. the e-file. Sometimes abbreviated "KP". Also king bishop pawn (KBP), king knight pawn (KNP), and king rook pawn (KRP) for a pawn on the f-, g-, or h-file, respectively. An opening that begins 1.e4. Also called king's pawn opening. Or king's rook. The rook that is on the kingside at the start of the game. The terms king bishop and king knight are also used. Sometimes abbreviated "KR", "KB", and "KN", respectively. Or king's side. The side of the board (half-board) the kings are on at the start of the game (the e- through h-file), as opposed to the queenside. Also called king's wing. A consecutive series of king moves designed to bring the king to a safer square. For example, if a player has castled kingside but the opponent has sacrificed a piece to destroy the kingside pawn cover, they may choose to walk the king over to the queenside to shelter behind the queenside pawns. See also King walk. Or knight's pawn. A pawn on the knight's file, i.e. the b-file or g-file. Sometimes abbreviated "NP". A puzzle that challenges a person to set a knight on an empty chessboard, and make the piece move around (as it moves in a chess game), but to visit every square only once. The knight’s tour is the most well known of a variety of “tours” and puzzles based on chess pieces. A "closed" tour (also known as a "re-entrant tour") ends on the same square on which it began and needs 64 moves. An "open" tour ends on a different square and needs only 63 moves. See Single-elimination tournament. A tournament conducted as a series of matches in which the winner of each match advances to the next round and the loser is eliminated. Well-known chess tournaments held in the knockout format include London 1851 and the 2007 Chess World Cup. Cf. round-robin tournament and Swiss tournament. This phenomenon, described by Alexander Kotov in his 1971 book Think Like a Grandmaster, can occur when a player does not find a good plan after thinking long and hard on a position. The player, under time pressure, then suddenly decides to make a move that he has hardly thought about at all, and it may not be a good move for that reason. [from German, "war game"] Kriegspiel is a chess variant played by two opponents who can only see their own board, and one monitoring umpire who makes the moves of both players on a neutral board. It requires three chess sets and boards. The players make their moves based on limited information from the umpire. It was introduced in 1898. It is sometimes referred to as blind chess, not be confused with blindfold chess. The symbol sometimes used for the knight when recording chess moves in descriptive notation, mainly in older literature. An N is used instead in algebraic notation and in later descriptive notation to avoid confusion with K, the symbol for the king. A form of chess with an extremely short time limit, either blitz chess or bullet chess. One of the two bishops that moves only on the light squares. In the initial position, White's light-square bishop is on f1; Black's is on c8. Cf. dark-square bishop. The 32 light-colored squares on the chessboard, such as h1 and a8. Cf. dark squares. 1. A sequence of moves, usually in the opening or in analyzing a position. 2. An open path for a piece (queen, rook, or bishop) to move or control squares. A piece whose movement is defined to be along straight lines of squares (i.e. the rook, bishop, and queen). One of the two diagonals with eight squares (a1–h8 or h1–a8). A bishop, rook, or queen. A piece vulnerable to opponent attacks because it is undefended and cannot easily be withdrawn or supported. A position vulnerable to opponent attacks because it is overextended or its pieces are uncoordinated. A defeat for one of the two players, which may occur due to that player being checkmated by the other player, resigning, exceeding the time control, or being forfeited by the tournament director. In chess, a zero-sum game, this results in a win for the other player. White wins by 1.Rd1+ Ke7 2.Rd4! Ra1 3.Kc7 Rc1+ 4.Kb6 Rb1+ 5.Kc6 Rc1+ 6.Kb5 Rb1+ 7.Rb4 and the pawn queens. A well-known rook and pawn versus rook endgame position in which the player with the extra pawn can force a win by cutting off the opponent's king and placing a rook on the 4th rank in order to block the opponent's rook checks, thereby allowing the pawn to queen. [from German, "air"] Space made for a castled king to give it a flight square to prevent a back-rank mate. Usually luft is made by moving a pawn on the second rank in front of the king. See also flight square. The principal, most important, or most often played variation of an opening. A larger numbers of pawns on one flank opposed by a smaller number of the opponent's; often a player with a majority on one flank has a minority on the other. A queen or rook, also known as a heavy piece. The primary distinction of major pieces versus minor pieces is that major pieces are capable of checkmate with only their own king for support, as the enemy king is unable to step across the ranks and files they control. On an otherwise empty board, a major piece can move from any square to any other square in at most two moves. A piece or a pawn, when the term piece is used as exclusive of pawns. A bind on the light squares in the center, particularly d5, obtained by White by placing pawns on c4 and e4. Named for Géza Maróczy, it originally referred to formations arising in some variations of the Sicilian Defence, but the name is now also applied to similar setups in the English Opening and the Queen's Indian Defense. It was once greatly feared by Black but means of countering it have been developed since the 1980s and earlier. Loosely, a strong chess player who would be expected to beat most amateurs. It may also refer to a formal title such as International Master or National Master. Standards vary, but a master will usually have an Elo rating of over 2200. A competition between two individuals or two teams. A match may be the entire competition, or it may be a round in a knockout tournament or team tournament. A chess match always consists of at least two games, and often many more. All of a player's pieces and pawns on the board. The player with pieces and pawns of greater value is said to have a "material advantage". When a player gains a material advantage they are also said to be "winning material". See Chess piece relative value. Playstyle characterised by a willingness to win material at the expense of positional considerations. Chess computers are often materialistic. An attack aimed at checkmating the enemy king. A position or series of moves that leads to forced mate. Modern Chess Openings, a popular chess opening reference. Often the edition is also given, as in MCO-14, the 14th edition. Cf. ECO. The part of a chess game that follows the opening and comes before the endgame, beginning after the pieces are developed in the opening. This is usually roughly moves 20 through 40. A short game (usually no more than 20 to 25 moves), for example: 1.e3 e5 2.Qf3 d5 3.Nc3 e4 4.Qf4?? Bd6! and White resigned in NN–Künzel (1900, Europe) because the queen is trapped. However, a significant minority of authors include games up to 30 moves. Usually only decisive games (not draws) are considered miniatures. Ideally, a miniature should not be spoiled by an obvious blunder by the losing side. A miniature may also qualify as a brilliancy. The Opera game is a famous example. Sometimes called a brevity [chiefly British]. See also Glossary of chess problems#miniature. The exchange of a bishop for a knight. An advance of pawns on the side of the board where one has fewer pawns than the opponent, usually carried out to provoke a weakness. A bishop or knight. Unlike major pieces, minor pieces are unable to contain the enemy king or block his advance alone, as he can simply pass through the holes in their line of attack. Compared to major pieces, minor pieces also find it difficult to navigate the entire board; a knight may require four moves to reach a square two squares away, while a bishop can only ever control half of all squares. Pawns on central squares able to advance without becoming weak. The ability of a piece(s) to move around the board. Having space. A fumble by a player in the use of a computer control tool while playing chess on the Internet, that results in an unintended move. A full move is a turn by both players, White and Black. A turn by either White or Black is a half-move, or (in computer context) one ply. The sequence of moves one chooses to play an opening or execute a plan. Different move orders often have different advantages and disadvantages. A plan that uses certain moves, can sometimes be improved by making the identical moves but in a different sequence. See also transposition. Coined by Nimzowitsch to refer to the placing of a rook on closed file in anticipation that the opponent is going to open the file. This move may either achieve a position with a rook on an open file, or it may alternatively hinder the opponent's intentions (prophylaxis). The meaning of the word has since expanded to refer to any rook move that appears to have a hidden purpose. 1. Symbol used for the knight when recording chess moves in English. 2. An abbreviation for novelty. An abbreviation sometimes used for the chess opening reference Nunn's Chess Openings. Cf. ECO and MCO. Traditionally used in game scores to indicate a player whose name is not known. The origin is uncertain. It may be an abbreviation of the Latin nomina ("names"), or it may be short for the Latin phrase nomen nescio ("name unknown"). A standard of competitive performance that is required in order for a chess player to be awarded one of several titles, such as Grandmaster, International Master, or Woman Grandmaster, etc. The chess organization, such as FIDE, that awards the titles, will establish specifically what a norm is. For example a candidate might achieve a norm if they play in a tournament and face a certain number of grandmasters, and then have a certain number of wins in that tournament against players that are above a certain rating, and so on. If the candidate then collects a certain number of norms, three for example, they will win a grandmaster title. The details that define a norm can be obtained from the chess organization, and the details will change from time to time. Any method of recording chess moves, allowing games to be later published, replayed and analyzed. The most common notation today is algebraic notation, which is used internationally. Formerly descriptive notation was standard in English language publications. There are also systems of notation for recording chess positions without the use of diagrams, the most common of which is Forsyth–Edwards Notation (FEN). Occupation of a rank or file means a rook or queen controls it; occupation of a square means a piece or pawn sits on it. A strongly positioned knight in enemy territory. A knight on e6 reaches out in eight directions, like the eight tentacles of an octopus. This refers to the stronger player giving the weaker player some sort of advantage in order to make the game more competitive. It may be an advantage in material, in extra moves, in time on the clock, or some combination of those elements. Since the advent of the chess clock, time odds have become more common than material odds. An international team chess tournament organized biennially by FIDE. Each team represents a FIDE member country. A file on which there are no pawns. A file on which only one player has pawns is said to be half-open. A game in which exchanges have opened files and diagonals, and there are few pawns in the center, as opposed to a closed game. Any opening that begins with the moves 1.e4 e5. Examples of Open Games include the Ruy Lopez, the Giuoco Piano, the Danish Gambit, and many others. The Open Game is also referred to as a Double King's Pawn Opening or Double King's Pawn Game. The beginning phase of the game, roughly the first dozen moves, but it can extend much farther. In the opening players set up their pawn structures, develop their pieces, and usually castle. The opening precedes the middlegame. Home study and analysis of openings and defenses that one expects to play, or meet, in later tournament or match games. In high-level play, an important part of this is the search for theoretical novelties that improve upon previous play or previously published analysis. The set of openings played by a particular player. The breadth of different players' repertoires varies from very narrow to very broad. An opening that is defined by one player's moves and that can be played generally regardless of the moves of the opponent, with the goal of reaching a desired type of middlegame position. Sometimes several different move orders are possible. Examples include the Colle System and Hippopotamus Defence. noun. Unobstructed files and diagonals. See also open game. verb. To move or exchange pawns to bring about unobstructed files and diagonals. A tournament where anyone can enter, regardless of rating or invitation. Cf. closed tournament. See bishops on opposite colors. A situation in which two kings stand on the same rank, file or diagonal with one empty square between them. The player to move may be forced to move the king to a less advantageous square. Opposition is a particularly important concept in endgames. Cf. corresponding squares. See Best response. Both sides playing their best move at each turn, or one of equally good alternatives. One side tries to win as quickly as possible while the other side tries to delay it as long as possible, or optimal play may result in a draw. Cf. Solved game#Perfect play. An abbreviation for over the board. An outpost is a square protected by a pawn that is in or near the enemy's stronghold. Outposts are a favorable position from which one can launch an attack, particularly using a knight. A passed pawn near the edge of the board and not in the path of threats from the opponent's pawns. In the endgame, such a pawn can constitute a strong advantage, because it threatens to promote, and it also diverts the opponent's forces to restrain its advance. An overextended position results when a player has advanced pawns too far into his opponent's side without sufficient support. The premature advance can leave weaknesses in the player's camp or the advanced pawns themselves may be weak ("overextended pawns"). A piece that has too many defensive duties. An overloaded piece can sometimes be deflected, or required to abandon one of its defensive duties. The strategy of protecting an important pawn or square more than is apparently necessary. This serves to dissuade the opponent from attacking that point, and the latent power of the "over protectors" assembled around an important point, is a significant threat that can bear fruit at a small tactical change in the position. Aron Nimzowitsch coined the term and was a proponent of overprotection. 1. A game played face-to-face with the opponent, as opposed to a remote opponent as in online chess or correspondence chess. 2. Analysis carried out during a game in real time (not necessarily a face-to-face game) as opposed to during preparation. Finding accurate moves over the board is harder than finding them with computer assistance in one's own time. "I looked up the gambit Smith played and there's a line that refutes it, but I couldn't find it over the board." Symbol used for the pawn when recording chess positions in English. Also used for the pawn when recording chess moves in descriptive notation. The assignment of opponents in a tournament. The most common pairing methods used in chess tournaments are round-robin and the Swiss system. White with a passed pawn on b7. Black has a passed pawn on g6. A pawn that has no pawn of the opposite color on its file or on any adjacent files on its way to queening. Describes a piece or pawn that is inactive and able to move to or control relatively few squares, or a position without possibilities for attack. or counterplay. Antonym: active. The sacrifice of a piece, by moving a different piece, leaving the sacrificed piece under attack. A part of chess thinking that involves remembering and recognizing certain recurring aspects large and small, visual and dynamic. It is a kind of thinking that gives an advantage to a player with great experience. It is distinct from the intellectual activity of calculation. It uses intuitive thinking that is familiar to humans, but is foreign to computers. It can be developed by studying chess puzzles. It has been studied by Adriaan de Groot, and other scientists, who have attempted to discover how chess players think. A weak chess player (from German: patzen, "to bungle"). See also woodpusher. A type of odds game, common in the 18th and 19th centuries, in which the superior player plays Black and begins the game with one of their pawns, usually the king bishop pawn, removed from the board; plus White gets an extra move at the start. A pawn move that attacks an enemy pawn in order to open up lines and/or challenge the opponent's pawn structure. See also break. White has a large pawn center in the King's Indian Defence, Four Pawns Attack. Or pawn centre. A player's pawns in the center of the board. Pawns on the squares adjacent to the center may also be considered part of the pawn center. Having a strong pawn center was considered absolutely essential until the hypermodernist school introduced some new ideas. See King's Indian Defence, Four Pawns Attack for an example of an opening leading to an extended pawn center. Two or more pawns of the same color diagonally linked. A pawn chain’s weakest point is the base, because it is not protected by another pawn. See also pawn structure. Black has three pawn islands and White has two. The pawn on e5 is not isolated because it is adjacent a file that has a white pawn. A group of pawns of one color on consecutive files with no other pawns of the same color on an adjacent file. A pawn island consisting of one pawn is an isolated pawn. A situation where both opponents are pushing a passed pawn in effort to be first to promote. Two connected passed pawns. "Roller" refers to their ability to defend one another as they advance toward promotion. An attacking technique where a group of pawns on one wing is advanced to break up the defense. The placement of the pawns during the course of a game. As pawns are the least mobile of the pieces and the only pieces unable to move backwards, the position of the pawns greatly influences the character of the game. An abbreviation for the Professional Chess Association. A number reflecting the approximate rating level at which a player performed in a particular tournament or match. It is often calculated by adding together the player's performances in each individual game, using the opponent's rating for a draw, adding 400 points to the opponent's rating for a win, and subtracting 400 points from the opponent's rating for a loss, then dividing by the total number of games. For example, a player who beat a 2400-rated player, lost to a 2600, drew a 2500, and beat a 2300, would have a performance rating of 2550 (i.e. 2800 + 2200 + 2500 + 2700, divided by 4). When a player puts the opponent in check, and the check could be repeated endlessly, the game will be declared a draw by repetition. The expression is often shortened to perpetual. This tactic can be resorted to as a form of insurance in a losing position. An abbreviation for Portable Game Notation. Usually refers to an important chess endgame that illustrates a drawing technique when the defender has a king and rook versus a king, rook, and pawn. It is also known as the third rank defense, because of the importance of the rook on the third rank cutting off the opposing king. It was analyzed by Philidor in 1777. See also Rook and pawn versus rook endgame. 1. One of the chessmen or figures used to play the game—king, queen, rook, bishop, knight or pawn. Each piece type has its own rules of movement on the board. This is the definition used in the context of the rules of chess, for example the touched piece rule. 2. When annotating or discussing chess games, the term "piece" usually excludes pawns. It may be used collectively for all "non-pawns", for example "White's pieces are well posted". In some contexts, it may refer specifically to a minor piece, for example "I hung a piece" or "I sacrificed a piece for two pawns". When a piece is attacked but cannot legally move, because doing so would expose the player’s own king to the attack; or when a piece is attacked and can legally move out of the line of attack, but such a move would expose a more valuable piece (or an unprotected piece) to capture. See absolute pin and relative pin. A strategy employed in a specific position to optimize a player's advantages while minimizing the impact of positional disadvantages. Said of an opening, a position, or move that gives the person playing it a tenable position. To make a move intuitively and without analyzing the move. Term mainly used in computer chess to denote one play of either White or Black. Thus equal to half a move. Black has accepted the "poisoned" b2-pawn with 8...Qxb2 in the Sicilian Defence, Najdorf Variation. An unprotected pawn that, if captured, causes positional problems or material loss. Any of several opening variations, the best-known of these being in the Najdorf Variation of the Sicilian Defence, in which there is a poisoned pawn. This is a popular computer-processible ASCII format for recording chess games (both the moves and related data). Abbr. PGN. Play based on strategy, on gaining and exploiting small advantages, and on analyzing the larger position, rather than calculating the more immediate tactics. A player who specializes in positional play, as distinguished from a tactician. A sacrifice in which the lost material is not regained via a combination, but instead gains positional compensation. These typically require deep positional understanding and are often overlooked by computers. Also known as a true sacrifice, as opposed to a pseudo sacrifice or sham sacrifice. Analysis of a game after it has concluded, typically by one or both players and sometimes with spectators (kibitzers) contributing as well. A player who has just lost the game thanks to a dubious move has the chance to win the post-mortem by finding a better one. A well-analyzed novelty in the opening that is not published but first used against an opponent in competitive play. A technique of increasing one's advantage by causing the opponent, who has one weakness, to have a second weakness. Even if both weaknesses are minor, the fact of having two, in practice, becomes a major weakness. A Russian term for particular tactics that depend on pawn structure. An elegant and counterintuitive tactical shot, of the type generally found in chess problems rather than in actual play, can be termed problem-like. Advancing a pawn to the eighth rank, converting it to a queen, rook, bishop or knight. Promotion to a piece other than a queen is called underpromotion. A strategy that frustrates and protects against an opponent's plan or tactic for fear of the consequences. See also blockade, overprotection, and mysterious rook move. A passed pawn that is supported by another pawn. To move a pawn forward (v.), or a pawn move forward (n.). Symbol used for the queen when recording chess moves in English. The Queen's Gambit Accepted opening. The Queen's Gambit Declined opening. The Queen's Indian Defense opening. A round-robin style tournament between four players, where each participant plays every other participant once. 2. verb. The act of promoting a pawn to a queen. Or queen's bishop. The bishop that is on the queenside at the start of the game. It is abbreviated "QB". Promotion to a queen. Also called promotion. Rarely used to indicate promotion to a knight, rook, or bishop (i.e. underpromotion) as well. Or queen's knight. The knight that is on the queenside at the start of the game. The terms queen bishop and queen rook are also used. Sometimes abbreviated "QN", "QB", and "QR", respectively. Or queen's pawn. A pawn on the queen's file, i.e. the d-file. Sometimes abbreviated "QP". Also queen rook pawn (QRP), queen knight pawn (QNP), and queen bishop pawn (QBP) for a pawn on the a-, b-, or c-file, respectively. An opening that begins 1.d4. Also called queen's pawn opening. Or queen's rook. The rook that is on the queenside at the start of the game. The terms queen bishop and queen knight are also used. Sometimes abbreviated "QR", "QB", and "QN", respectively. The side of the board (board-half) the queens are on at the start of the game (the a- through d-file), as opposed to the kingside. Also called queen's side or queen's wing. The same as sudden death. A move that does not attack or capture an enemy piece. Symbol used for the rook when recording chess moves in English. A system of opening classification codes introduced by Braslav Rabar for Chess Informant. The system was used by Informant publications from 1966 to 1981 but has since been replaced by ECO codes. Another term for Horwitz bishops. White ranks are indicated at the left (a-file); Black ranks are indicated at the right (h-file). A row of the chessboard. In algebraic notation, ranks are numbered 1–8 starting from White's side of the board; however, players customarily refer to ranks from their own perspectives. For example: White's king and other pieces start on his or her first (or "back") rank, whereas Black calls the same rank the eighth rank; White's seventh rank is Black's second; and so on. If neither perspective is given, White's view is assumed. This relative reference to ranks was formalized in the older descriptive notation. A form of chess with reduced time limit, usually 30 minutes per player. The capture of an opponent's piece that previously made a capture, and usually played immediately following the opponent's capture move. The capture and recapture occur on the same square, and usually the pieces captured and recaptured have the same value. To demonstrate that a strategy, move, or opening is not as good as previously thought (often, that it leads to a loss), or that previously published analysis is unsound. A refutation is sometimes colloquially referred to as a bust. A refutation in the context of chess problems or endgame studies is often called a cook. A pin where it is legal to move the pinned piece out of the line of attack. Contrast with absolute pin where the pinned piece is not permitted to move because it would expose the king to check. A move a player has available. Such a move may not be crucial to the position on the board, but being able to force the opponent to move by making a reserve move can on occasion result in a significant advantage. To concede loss of the game. A resignation is usually indicated by stopping the clocks, sometimes by offering a handshake, or by saying "I resign". A traditional way to resign was by tipping over one's king, but this is not done nowadays. It is common for a game to be resigned, rather than for it to end with checkmate, because experienced players can foresee the checkmate. A player who in a hopeless position intentionally runs out of time to avoid having to resign can be said to have resigned on time. This is usually performed in a more subtle manner than that of Curt von Bardeleben walking out of the tournament hall against Wilhelm Steinitz. A player low on time and in a losing position may simply "forget" to pay any attention to the clock. Romantic chess was the style of chess prevalent in the 19th century. It is characterized by bold attacks and sacrifices. A maneuver that places a rook in front of its own pawns, often on the third or fourth rank. This can allow the rook to treat a half-open file as if it were an open file, or a closed file as if it were half-open. Or rook's pawn. A pawn on the rook's file, i.e. the a-file or h-file. Sometimes abbreviated "RP". This is a tournament in which each participant plays every other participant an equal number of times. In a double round-robin tournament the participants play each other exactly twice, once with white and once with black. A round robin tournament is commonly used if the number of participants is relatively small. See also Swiss tournament. A fork threatening the king and queen. A king or queen. In chess variants, the term refers to any piece that must be protected from capture; under this definition, only the king is royal in orthodox chess. [from German: Springer, "jumper"] Alternate notation for the knight. Used rather than K, which means king. Short for sacrifice, usually used to describe a sacrifice for a mating attack. A move or capture that voluntarily gives up material in return for an advantage such as space, development, or an attack. A sacrifice in the opening is called a gambit, especially when applied to a pawn. An abbreviation for standard (or short) algebraic notation (e.g. 1.Nf3), as opposed to long algebraic notation (e.g. 1.Ng1-f3). [from French] See blindfold chess. A four-move checkmate (common among novices) in which White plays 1.e4, follows with Qh5 (or Qf3) and Bc4, and finishes with 4.Qxf7#. The sheet of paper used to record a game in progress. During formal games, it is usual for both players to record the game using a score sheet. A completed score sheet contains the game score. Lengthy OTB games can be adjourned. To prevent unfair advantage, the players can agree on the next move being secretly recorded in a sealed envelope. Upon resumption, the arbiter makes the sealed move and the game continues. See also Adjournment (games). An assistant hired to help a player in preparation for and during a major match or tournament. The second assists in areas such as opening preparation. The second assisted with adjournment analysis, before the practice of adjournments was abandoned in the 1990s. The expression "the second player" is sometimes used to refer to Black. An opening that begins with White playing 1.d4 and Black replying with a move other than 1...d5. See also Open Game and Closed Game. An opening that begins with White playing 1.e4 and Black replying with a move other than 1...e5. Also called a half-open game. See also Open Game and Closed Game. An offer of material that is made at no risk, as acceptance would lead to the gain of equal or greater material or checkmate. This is in contrast to a true sacrifice in which the compensation is less tangible. Also called a pseudo sacrifice. Risky, double-edged, highly tactical. Sharp can be used to describe moves, maneuvers, positions, and styles of play. Slang for an unexpected or sharp move that typically makes a tactical threat or technical challenge for the opponent. A move that has a dynamic tactical effect on a position, but that does not capture or attack an enemy piece. See also quiet move. A strategy of exchanging pieces, often with one of the following goals: as a defensive measure to reduce the size of an attacking force, when having the advantage to reduce the opponent's counterplay, to try to obtain a draw, or as an attempt to gain an advantage by players who are strong in endgame play with simplified positions. Also called liquidation. A form of chess in which one player plays against several players simultaneously. It is usually an exhibition. [from German, "sitting flesh"] The ability to sit still. An attack on a valuable piece, compelling it to move to avoid capture and thus expose a less valuable piece which can then be taken. See also X-ray. A casual or "pickup" game, usually played without a chess clock. At chess tournaments, a skittles room is where one goes to play for fun while waiting for the next formal game. A checkmate delivered by a knight in which the mated king is unable to escape because it is surrounded (or smothered) by its own pieces. In the tournament played by Sofia rules, players are not allowed to draw by agreement. They could have draws by stalemate, threefold repetition, fifty-move rule, or insufficient material. Other draws are allowed only if the arbiter declares the game reached a drawn position. An adjective used to describe a move, opening, or manner of play that is characterized by minimal risk-taking and emphasis on quiet positional play rather than wild tactics. A queen development in front of its own pawns, often early in the opening, usually for the purpose of exploiting an advantage in space or punishing an error by the opponent. So called because the queen is usually developed behind its own pawns for its protection. A correct move or plan. A sound sacrifice has sufficient compensation, a sound opening or variation has no known refutation, and a sound puzzle or composition has no known cooks. Antonym: unsound. The squares controlled by a player. A player controlling more squares than the other is said to have a spatial advantage. The Spanish bishop on b5 in the Ruy Lopez. A white king bishop developed to b5. This is characteristic of the Ruy Lopez, also known as the Spanish Opening. A harmless check given by a player who is about to lose the game, that serves no purpose other than to momentarily delay the defeat. Making pawn moves that limit mobility, freedom and options for the opponent, typically causing a zugzwang. A position in which the player whose turn it is to move has no legal move and their king is not in check. A stalemate results in an immediate draw. A piece's starting square is the square it occupies at the beginning of the game. The standard design of chess pieces, required for use in competition. A stem game is the chess game featuring the first use of a particular opening variation. Sometimes, the player or the venue of the stem game is then used to refer to that opening. Win characterised by gradual accumulation of advantages and complete prevention of counterplay. The basis of a player's moves. The evaluation of positions and ways to achieve goals. Strategy is often contrasted with tactics, which are the calculations of more immediate plans and combinations. A forceful or good move, a position having good winning chances, a highly rated player or one successful in tournaments, or a tournament having a sizable number of strong players competing, such as grandmasters. A "strong showing" refers to a player's high win ratio in a tournament. Antonym: weak, e.g. a weak square. The side with a material or positional advantage. 1. A "strongpoint defense" means an opening that defends and retains a central pawn (White: e4 or d4; Black: e5 or d5), as opposed to exchanging the pawn and relinquishing occupation of that central square. 2. More generically, a strongpoint can be any square heavily defended. A square on a player's 4th or greater rank on which the player can post a piece that cannot or will not be driven away by enemy pawns. Cf. weak square. The most straightforward time control for a chess game: each player has a fixed amount of time available to make all moves. See also fast chess. A square that cannot be attacked by a pawn, and that can be occupied as a home base for a piece, usually a knight. A ruse or trick played from a position that is inferior. A system used in tournaments to determine pairings. In every round each player is paired with an opponent with the same or similar score. See also round-robin tournament. A symmetrical position on the chessboard means the positions of one's pieces are exactly mirrored by the opponent's pieces. This most often occurs when Black mimics White's opening moves. Black is said to break symmetry when they make a move no longer imitating White's move. [from Arabic: طبيعة ṭabīʕa, "essence"] Also tabiya. In chess openings a tabia is a key point. It may be a well-known “point of departure” where variations branch off, it may be a position that is reached so often that the real game begins after this initial series of book moves. A player who specializes in tactical play, as distinguished from a positional player. Combinations, traps, and threats. Play characterized by short-term attacks, requiring calculation by the players, as distinguished from positional play. Used in casual games whereby both players agree to undo one or more moves. The general principle that rooks usually should be placed behind passed pawns, either one's own or one's opponent's. Named after Siegbert Tarrasch. An abbreviation for tournament director. The manner in which a player converts an advantageous position into a win. A unit of time considered as one move. A player may gain a tempo in the opening when the opponent moves the same piece twice. In the endgame, one may wish to lose a tempo by triangulation in order to gain the opposition. Plural: tempos or tempi. This Scotch Opening position contains tension due to the knights on c6 and d4. Both knights are currently adequately defended, so neither player is forced to release the tension. A position in which there are one or more exchanges possible, such as a pair of pawns facing each other on a diagonal where either can capture the other, is said to contain tension. Such a situation differs from a threat in that it does not need to be immediately resolved – for example, if both pawns are defended. The consequences of resolving the tension must be constantly considered by both players, in case there is a possibility of winning or losing material. This makes calculating the best move more complicated, and so there is a natural temptation to release the tension by making a like-for-like exchange (see simplification) or by moving the attacked piece. To keep the tension is to avoid resolving it, which is sometimes good advice depending on the position. This term is used in written analysis of chess games to refer to a move actually played in the game as opposed to other possible moves. Can be shortened to "text", for example "The text is inferior as it allows ...f5". Text moves are usually in bold whereas analysis moves are not. Suited to the demands of the position. The term "thematic move" is often applied to the key move of a thematic plan. A chess tournament in which every game must begin with a particular opening specified by the organizers, for example the Budapest Gambit (1.d4 Nf6 2.c4 e5). A move in the opening that has not been played before. Abbr. TN or N.
A plan or move that carries an intention to damage the opponent's position. A threat is a tactical weapon that must be defended against. A draw may be claimed if the same position occurs three times with the same player to move; and with each player having the choice of the same set of moves each time, including the right to capture en passant and the right to castle. See Tie-breaking in Swiss-system tournaments. This refers to a number of different systems that are used to break ties, and thus designate a single winner, where multiple players or teams tie for the same place in a Swiss system chess tournament. 1. In chess "time" refers to the amount of time each player has to think and calculate as measured by a chess clock. 2. The number of moves to complete an objective; for example, if a king is racing to stop a pawn from queening, and the king has too few moves, that may be referred to as "not enough time". See also tempo. The allowed time to play a game, usually measured by a chess clock. A time control can require either a certain number of moves be made per time period (e.g. 40 moves in 2½ hours) or it can limit the length of the entire game (e.g. 5 minutes per game for blitz). Hybrid schemes are used, and time delay controls have become popular since the widespread use of digital clocks. A time control that makes it possible for a player to avoid having an ever-decreasing amount of time remaining (as is the case with sudden death). The most important time delays in chess are Bronstein delay and Fischer delay. Also called time trouble. Having very little time on one's clock (especially less than five minutes) to complete one's remaining moves. See time control. An abbreviation for theoretical novelty. Also called touch-move rule. The rule that requires a player who touches a piece to move that piece unless the piece has no legal moves. If a player moves a piece to a particular square and takes their hand off it, the move must be to that square if it is a legal move. Castling must be initiated by moving the king first, so a player who touches their rook may be required to move the rook, without castling. The rule also requires a player who touches an opponent's piece to capture it if possible. In order to adjust the position of a piece within its square without being required to move it, the player should say "J'adoube" or "I adjust". A competition involving more than two players or teams, generally played at a single venue (or series of venues) in a relatively short period of time. A tournament is divided into rounds, with each round consisting either of individual games or matches in the case of knockout tournaments and team tournaments. The assignment of opponents is called pairing, with the most popular systems being round-robin and Swiss. Tournaments are usually referred to by combining the city in which they were played with the year, as in "London 1851", although there are well-known exceptions, such as "AVRO 1938". A book recording the scores of all the games in a tournament, usually with analysis of the best or most important games and some background on the event and its participants. One well-known example is Bronstein's Zurich International Chess Tournament 1953. The less comprehensive tournament bulletin is usually issued between the rounds of a prestigious event, giving the players and world media an instant record of the games of the previous round. Individual copies may be bundled together at the conclusion of the event to provide an inexpensive alternative to the tournament book. Organizer and arbiter of a tournament, responsible for enforcing the tournament rules and the laws of chess. Abbr. TD. Also tournament controller [chiefly British]. Arriving at a position using a different sequence of moves. With 4...Nbd7 Black sets a trap in the QGD (1.d4 d5 2.c4 e6 3.Nc3 Nf6 4.Bg5). White cannot win the pawn on d5 due to the Elephant Trap. A move that may tempt the opponent to play a losing move. See also swindle and List of chess traps. Trébuchet, whoever has the move loses. 1.Kg4 Kxe4 2.Kg3 Ke3 3.Kg2 Ke2 4.Kg3 e4 5.Kf4 e3 6.Ke4 Kf2 and the black pawn will queen. A technique used in king and pawn endgames (less commonly seen with other pieces) to lose a tempo and gain the opposition. Three pawns of the same color on the same file; considered a weakness due to their inability to defend each other. Also Troitzky line. Endgame analysis by Alexey Troitsky of two knights versus a pawn found certain pawn positions that result in win, draw or loss. The resulting pawn positions on each file form what is known as the Troitsky line or Troitsky position. A synonym for bishop pair. Also called the two bishops. A tactic (also known as removal of the guard) in which a defensive piece is captured, leaving one of the opponent's pieces undefended or underdefended. White to move should underpromote the c7-pawn to a rook; promoting to a queen gives stalemate. Promoting a pawn to a rook, bishop, or knight instead of a queen. Rarely seen unless the knight can deliver a crucial check, or when promotion to a rook or a bishop instead of a queen is necessary to avoid stalemate. This is a nonprofit organization, the governing chess organization within the United States, and one of the federations of the FIDE. Abbr. USCF. The act of breaking a pin by interposing a second piece between the attacker and the target. This allows the piece that was formerly pinned to move. An abbreviation for the United States Chess Federation. A sacrifice made for the purpose of clearing a square for a different piece of the same color. A move that opens one line and closes another. 1. A sequence of moves or an alternative line of play, often applied to the opening. A variation does not have to have been played in a game, it may also be a possibility that occurs only in analysis. Also called continuation. 2. The word Variation is also used to name specific sequences of moves within an opening. For an example, the Dragon Variation is part of the Sicilian Defence. A move that makes no threats except that it puts the obligation to move on the opponent. A waiting move is effective when the opponent has nothing but bad moves available (i.e. is in zugzwang). An abbreviation for the World Chess Championship. A pawn or square that can be attacked and is hard to defend. A square that cannot be easily defended from attack by an opponent. Often a weak square is unable to be defended by pawns (a hole) and can be theoretically occupied by a piece. Exchange or loss of a bishop may make all squares of that bishop's color weak resulting in a "weak square complex" on the light squares or the dark squares. An abbreviation for the Woman FIDE Master title. An abbreviation for the Woman Grandmaster title. The light-colored squares on the chessboard are often referred to as "the white squares" even though they often are some other light color. Similarly, "the white pieces" are sometimes actually some other (usually light) color. See also black. The designation for the player who moves first, even though the corresponding pieces, referred to as "the white pieces", are sometimes actually some other (usually light) color. See also Black and first-move advantage. An abbreviation for the Woman International Master title. A victory for one of the two players in a game, which may occur due to checkmate, resignation by the other player, the other player exceeding the time control, or the other player being forfeited by the tournament director. Chess being a zero-sum game, this results in a loss for the other player. In a tournament a bye may be scored as a win. See winning position. A combination in which two pieces work together to deliver an alternating series of checks and discovered checks in such a way that the opposing king is required to move on each turn. It is a potent technique, since, on every other move, the discovered check may allow the non-checking piece to capture an enemy piece without losing a tempo. The most famous example is Torre–Lasker, Moscow 1925. Also called a seesaw. The queenside a-, b-, and c-files; or the kingside f-, g-, and h-files. Also called flank. The name given to variations of several openings in which one player gambits a wing pawn, usually the b-pawn. A number calculated by adding together the number of games won and half of the number of games drawn, (ignoring the losses) then dividing that total by the total number of games that were played. Another way of calculating the winning percentage is by taking the percentage of games won by a player plus half the percentage of drawn games. Thus, if out of 100 games a player wins 40 percent, draws 32 percent, and loses 28 percent, the winning percentage is 40 plus half of 32, i.e. 56 percent. A position is said to be a winning if one specified side, with correct play, can eventually force a checkmate against any defense (i.e. perfect defense). Also called a won game. A women-only chess title ranking below Woman International Master. Abbr. WFM. The highest ranking gender-restricted chess title except for Women's World Champion. Abbr. WGM. A women-only chess title ranking below Woman Grandmaster and above Woman FIDE Master. Abbr. WIM. Slang for pieces. "A lot of wood came off the board" conveys that several piece exchanges occurred. A weak chess player, also referred to as a patzer or duffer. Colloquial, typically derogatory. A winner of the World Chess Championship. With a bishop, a rook pawn may be the wrong rook pawn, depending on whether or not the bishop controls its promotion square. A wrong rook pawn at a5 with a wrong-colored bishop. In this position, White cannot force promotion and Black can force a draw.